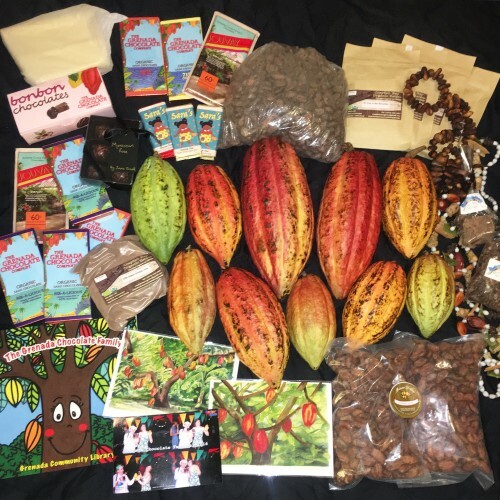 My experience at The Grenada Chocolate Festival 2015 was so incredible that I simply had to return to the festival the following year! 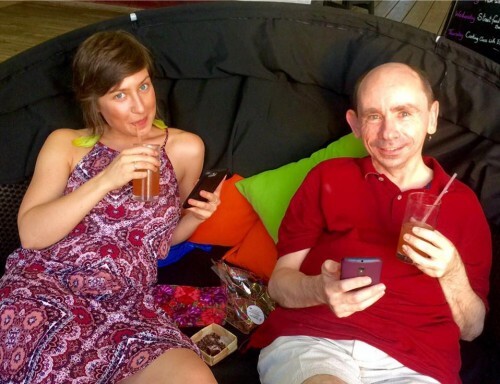 I kept in touch with Magdalena Fielden, the inspiring creator of the festival (which is now in its third year), and had the pleasure of taking part this time. Back in my natural habitat, surrounded by palm trees and chocolate! 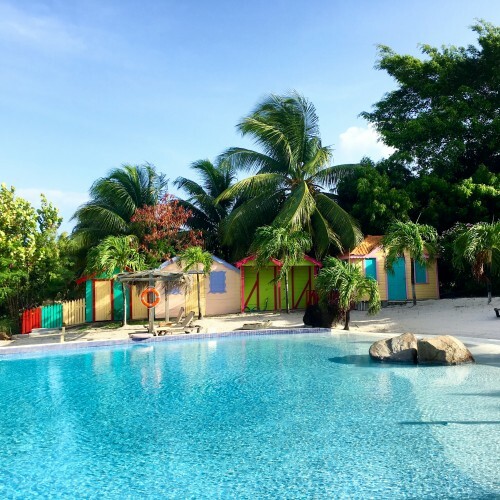 I flew to Grenada with my fellow chocolate friend Dom Ramsey for the 10 days of the festival and felt very lucky to be able to stay at the lovely True Blue Bay Resort again! 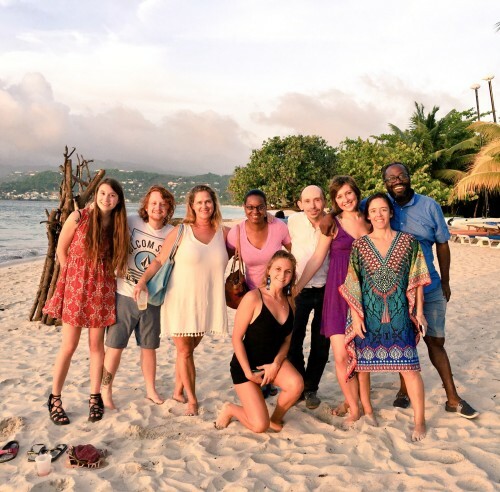 As soon as we arrived we got straight to work… with a delicious Grenadian rum punch that we had been craving the whole time that we had been away (don’t forget the sprinkle of nutmeg on top!) and Grenadian chocolates that were waiting for us in our rooms. We got there just in time to watch the gorgeous sunset! The festival began with the Grand Opening Party at Dodgy Dock, True Blue Bay. It was a cacao extravaganza! The whole place was decorated with cocoa pods, cocoa beans, golden cacao leaves and, of course, delicious Grenadian chocolate. 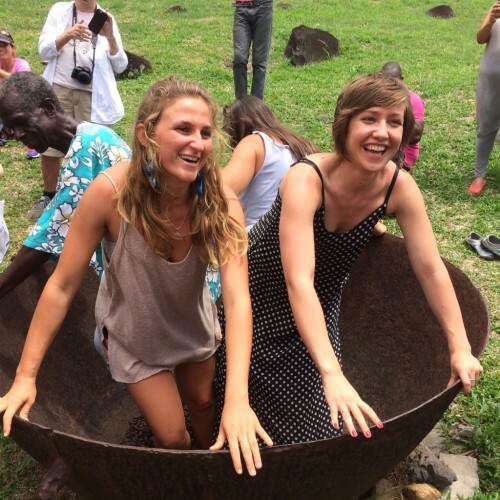 We indulged in chocolate-inspired Caribbean dishes while we sipped on cacao cocktails, danced to live steel drum music, and shopped at stalls of local chocolate makers, chocolatiers, cocoa farmers and artists. We were delighted to see some familiar faces, including Edmond from The Grenada Chocolate Company and Ana Rita Garcia Lascurain from Mucho Mundo Museum, Mexico City. 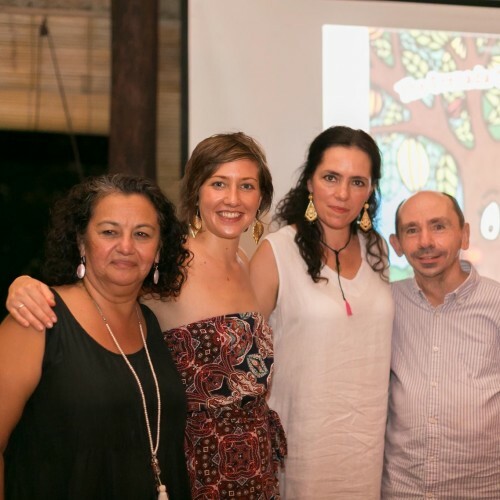 The first full day of the festival involved a day celebrating the Health Benefits of Cocoa. 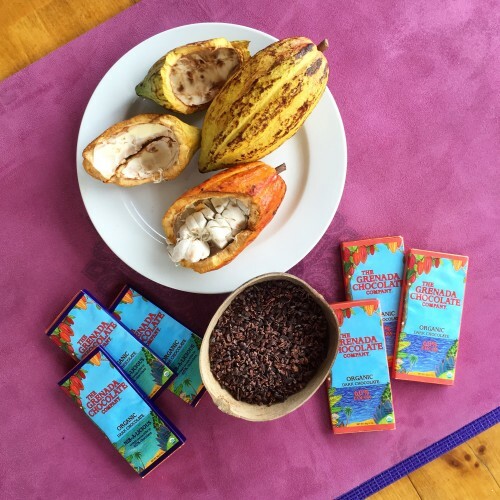 We started with a Yoga Chocolate Meditation at the Sankalpa Yoga Studio at True Blue, followed by an Indulgent Chocolate Breakfast and Healthy Benefits of Cocoa workshop by Ana Rita Garcia Lascurain of Mucho Mundo Museum. We made some of our own beauty products including a cacao lip balm using cacao that we ground on the metate (a ground stone tool used for processing grain and seeds), vitamin E oil and cocoa butter. It needed a little time to set but we were too impatient, as one can see from the photo below of Dom and myself trying it out! Essential materials for Chocolate Yoga Meditation! Dom and myself testing out the cacao lip balm! 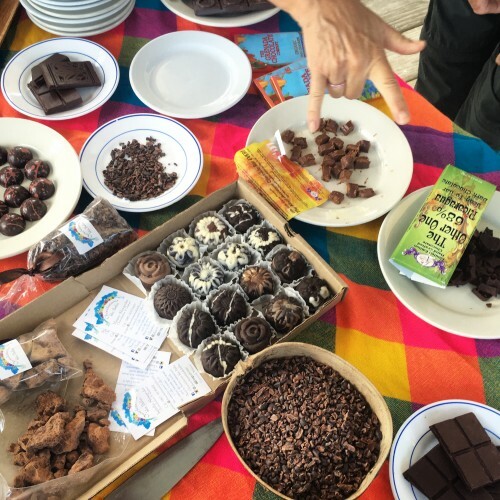 Monday’s theme was “It’s all about Bean to Bar” and included a trip to Belmont Estate and The Grenada Chocolate Company! We had visited both places last year but we were just as excited to go back. 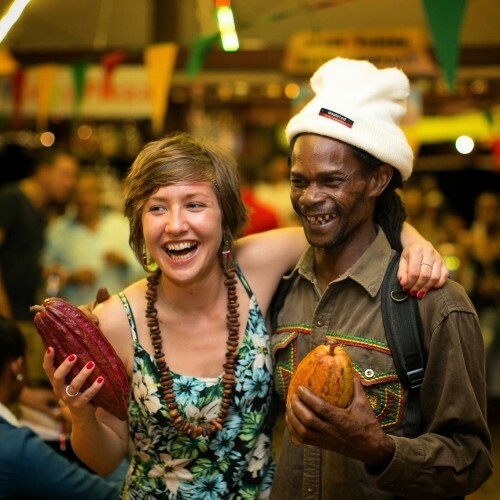 As I mentioned in my post about last year’s festival, Grenada has a very special place in the bean to bar chocolate world. 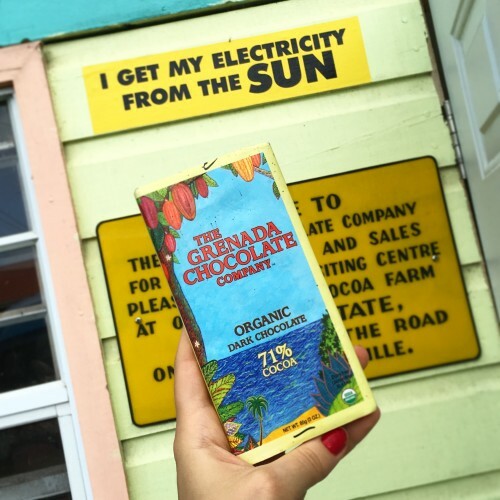 It is home to The Grenada Chocolate Company, the only solar-powered chocolate factory and, probably, the most ethical chocolate factory in the world! 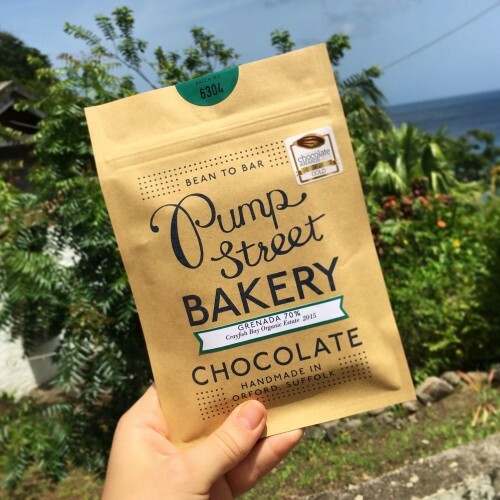 The Grenada Chocolate Company, founded by the late visionary, Mott Green, is farmer-owned and makes chocolate from tree to bar using 100% organic Grenadian cacao. We were given an in-depth explanation of chocolate production from “tree to bean” (the first half of “tree to bar” production) by Dr Darin Sukha, Research Fellow from the University of West Indies, Trinidad. 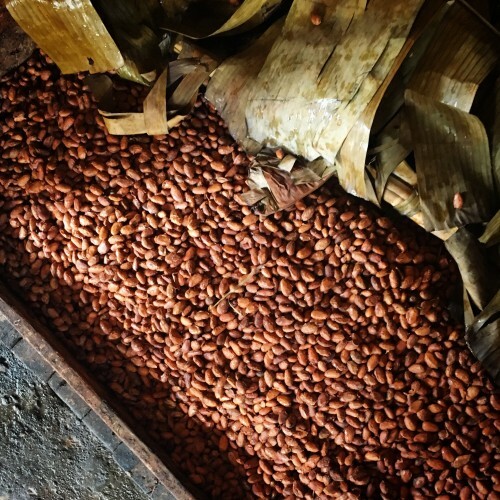 We visited the cocoa fields at Belmont Estate where everything is grown organically, then visited the cacao fermentation boxes and watched as they unloaded a batch that had completed fermentation and were ready for drying in the sun. The beans can also be dried inside greenhouse-like sheds during the wet season. Experienced cocoa farmers pick up and drop the cocoa beans to “hear” if they have sufficiently dried by the sound they make when they hit the table. This is usually at a moisture level of 6-7%. Traditionally, the cocoa beans are polished by dancing on them in large copper pots. Polishing removes any dried pulp residue on the bean, and gives it a smooth, polished look. 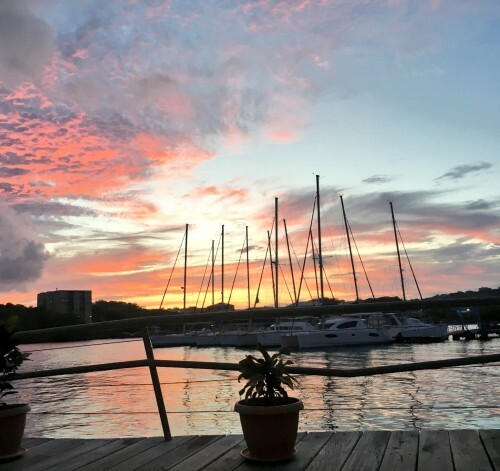 Prior to my trip to Grenada, I “met” Isabella Alexander on Instagram (@isabellachocolatier) after discovering her profile and admiring her beautiful photos. 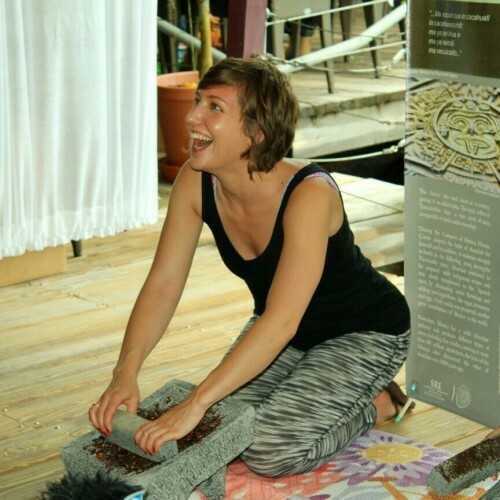 I realised that we shared many passions including chocolate, yoga and Central America! 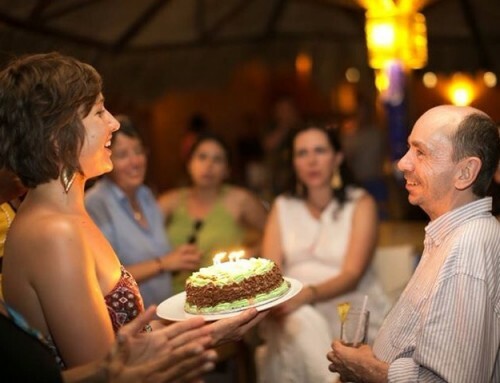 Isabella is co-owner and chocolatier for Chocolatería Isla Bella along with her business partner and mother, Megan, on the Caribbean island of Cozumel, Mexico. These two women are an inspiration; they have the most incredible relationship and I was fortunate enough to taste some of their chocolates, too, which truly blew me away. Isabella and I were pretty much joined at the hip from the moment we met. We had great fun “dancing the cocoa” together at Belmont Estate! Then we visited The Grenada Chocolate Company to see the other half of chocolate making from “bean to bar”. The factory is actually a converted house! 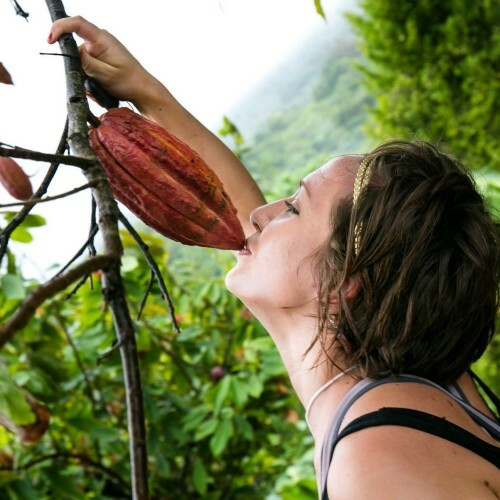 As mentioned previously, they are the only solar powered chocolate company in the world and one of a few “tree to bar” chocolate companies, where they control the chocolate making from the very beginning to the very end: the growing of the cocoa to the final, wrapped chocolate bar. 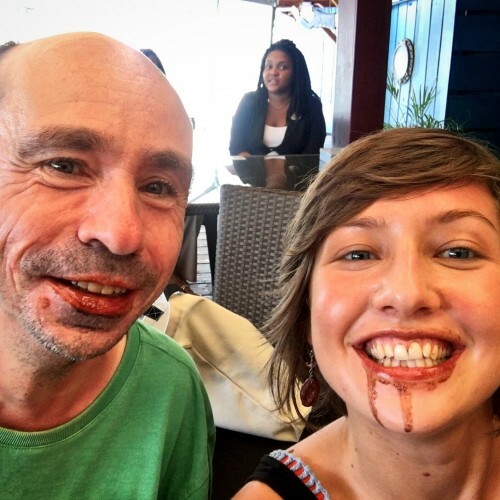 We finished the magical day at Belmont Estate and The Grenada Chocolate Company with a beer-fueled boogie at the West Indies Brewery, where we bumped into Jeff Shepherd of Lillie Belle Farms who supplied us with plenty of “Do Not Eat This Chocolate“! The following morning we had a chocolate tasting with products made by the talented chocolatiers and chocolate makers attending the festival. The tasting included: Zara Snell’s Moroccan Rose chocolates that won Zara her trip to the Grenada Chocolate Festival, a variety of different handmade chocolates by Chocolatería Isla Bella as well as their rustic Mexican chocolate made with Tabascan cacao, almonds, sugar and Mexican cinnamon, Lillie Belle Farms’ single origin Nicaraguan and The Most Awesome Chocolate Bar Ever, One/One Cacao’s Jamaican bean to bar, Damson Chocolate’s Brazilian 70% and Buffalo Milk bean to bar, and a bar that I made with Dom exclusively for the festival, using Grenadian beans with a touch of Grenadian nutmeg. Bringing the chocolate back to its roots! 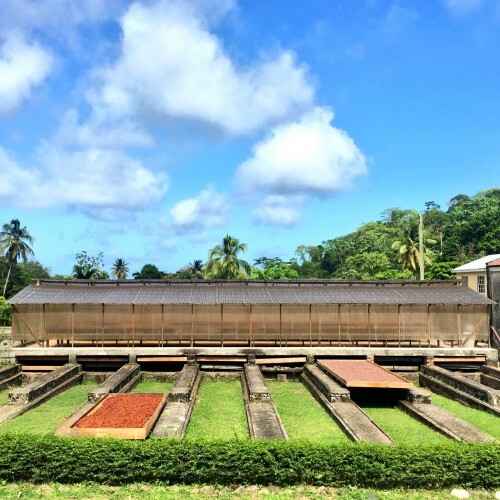 We spent some quality time at Crayfish Bay Organic Cocoa Estate, which produces beans for Pump Street Bakery’s award-winning Grenadian bar. Kim Russell, owner of Crayfish Bay, has started making his own chocolate from tree to bar with exceptional results. 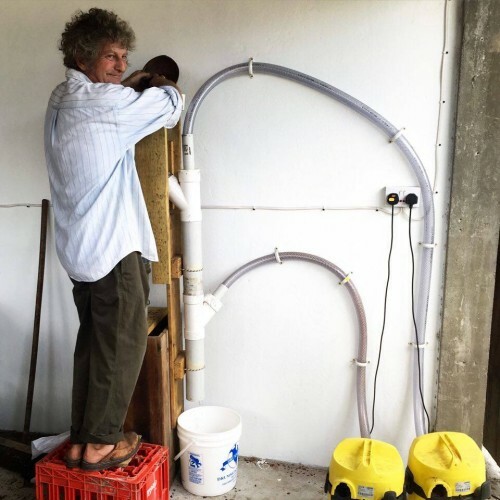 Kim sourced old parts and built his own roaster and winnowing machine from scratch, saving thousands of dollars. We tasted some of Kim’s farm-made chocolate and we were all very impressed! Congratulations, Kim! We also had the pleasure of working alongside the farmers for a day. They have an extraordinary amount of knowledge about cacao and work 8 very active hours a day harvesting cacao and maintaining the farm. They are paid the equivalent of £5 a day, which is significantly more than other cocoa farmers on the island. The bars that these beans go into are £6.25, and some people still think that this is expensive. 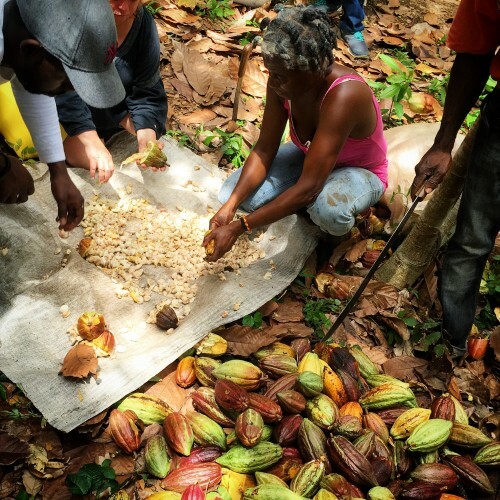 I believe that we need to educate people more to understand the value of the cocoa, because without these talented and hard-working farmers, we would have nothing. Dom and I were delighted to be able to share some of our passion and expertise with a bean to bar demonstration held at True Blue. Dom and I became friends through the hashtag #beantobar and our mutual passion for chocolate making. We have shared many ideas and made some batches together as well. 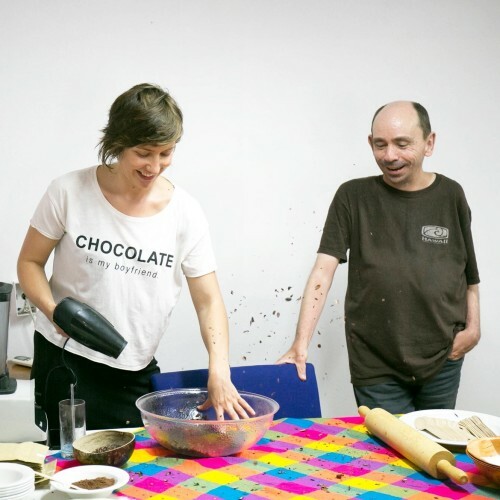 It was great fun to demonstrate how we make chocolate ourselves using basic equipment such as a rolling pin and a hairdryer, and hopefully inspiring some people from our audience to start making chocolate! The evening involved a chocolate tasting at the beautiful La Luna Resort. I started off the tasting with Duffy’s Mayan Milk and my favourite bar by Marou Chocolate; Tien Giang. Dom followed with Fruition Chocolate’s Dark Milk with Flor de Sel and his own Brazil 70% Fazenda Camboa. Ana Rita completed the tasting with her own Mexican bean to bar “Maravilla” made with cocoa from the Montes Azules Reserve, Chiapas, and Crayfish Bay’s farm-made tree to bar chocolate. It was also Dom’s birthday, so we finished the evening with a cake made by the lovely staff of True Blue Bay! 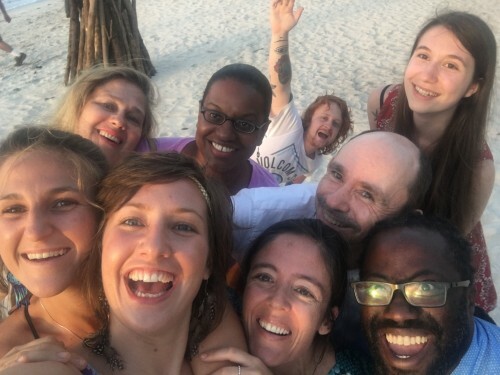 We celebrated the end of an incredible week of cacao festivities with a bonfire beach party at Mount Cinnamon on Grand Anse Beach. There was lots of dancing and chatting and many hugs shared. This was the last night that the Chocolate Gang would spend together after a week full of bonding. 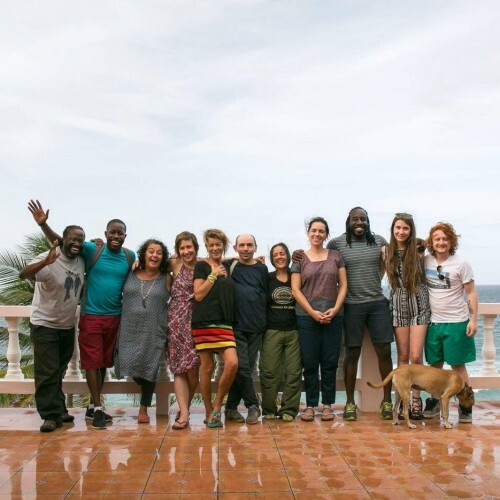 I’ve said it before and I will say it again; I find the world of chocolate and cacao fascinating, but it’s truly the connecting with fellow passionate chocolate lovers that really fills my heart with love. This trip was no exception! Not only did we get to experience some magical events, but lifelong chocolate friendships were created, too! Thank you to Zara, the incredibly talented young chocolatier, I can’t wait to see your career progress. And to Ben, Zara’s lovely and very entertaining boyfriend. Thank you to Megan and Isabella from Chocolatería Isla Bella. You have the most beautiful and inspiring relationship and make delicious chocolates, too! 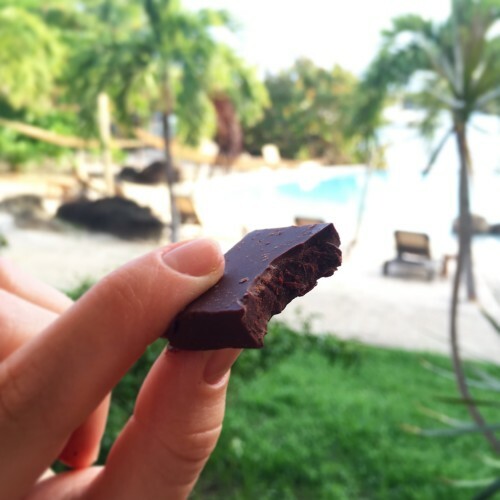 Thank you to Nick and Marta, a gorgeous chocolate-and-pilates-loving couple from Jamaica. I also can’t wait to see your chocolate career progress! 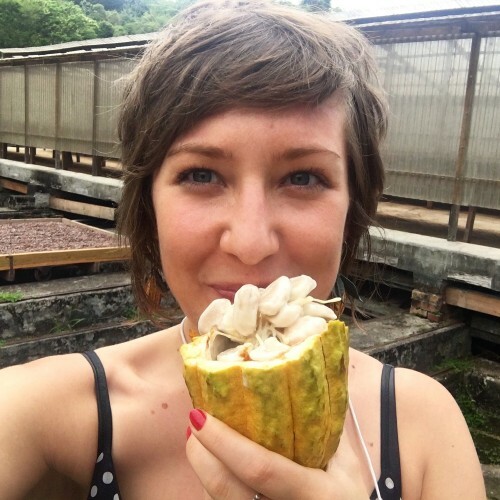 Thanks to Ana Rita for sharing your cacao expertise. It’s always a pleasure to spend time with you. Thanks to my chocolate friend Dom for your passion and support! Thank you to Aaron for your enthusiasm, I am excited to see your Grenadian chocolate project develop! Thanks to Arthur Daniel for your enthusiasm and talent at capturing beautiful (and sometimes shocking!) moments of the festival. A huge thank you to Magdalena for making this incredible event happen and connecting all of us. Your work is magnificent and I am so grateful to have experienced it! Thank you to everyone else involved in making this an amazing and unforgettable cacao adventure… True Blue Bay Resort, the Fielden family, Heidi and Clive Roberts, Crayfish Bay Organic Cocoa Estate, Belmont Estate, The Grenada Chocolate Company, Dr Darin Sukha, Petite Anse Hotel, Lille Belle Farms, House of Chocolate, La Luna Resort, Mount Cinnamon Resort and many more! Grenadian cacao goodies, back in London! Wow, Truly awesome, what an experience! !